Summer is fast approaching and with longer, brighter, glorious days, who wants to spend any time in a stuffy gym?! The benefits of outdoor training far outweigh any gym session and guess what…its free! Rather than staring at the same 4 walls of the gym, exercising in a park amongst the trees will give an added boost and reduce any anxiety and stress. Exercising is generally good for our confidence but now there is evidence from the University of Essex that exercising in nature can improve self-esteem! With the varied terrain of the outdoors, you’ll be using those muscles you never thought you had! Studies show that there are benefits to exercising outdoors that can’t be replicated on a treadmill. There is the occasional run downhill, we stride differently when running outdoors and we apparently flex our ankles more. Then there’s the added perk of the Vitamin D we get from direct exposure to the sunlight. Vitamin D plays an important role in bone health and the immune system and it’s also a common treatment for mood disorders. The majority of our Vitamin D is produced when UV rays penetrate the skin and with our modern, sedentary office based lifestyles there is much concern that Vitamin D deficiencies are on the rise. 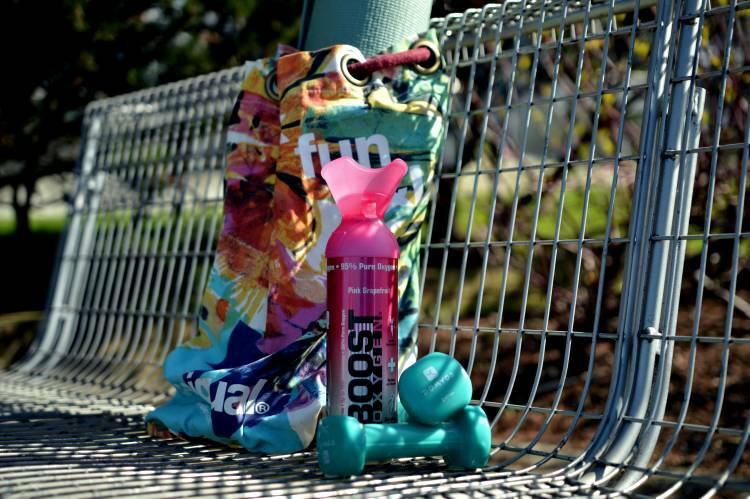 With all this in mind, why not kick-start your outdoor fitness regime with Boost Oxygen to support you? Breathing Boost Oxygen will help take your training to the next level. The extra burst of Oxygen will also prevent the build up of lactic acid enabling you to keep the momentum going and reach your fitness goals!